Note: No need to fill forms for those widow who are already getting benefit with this scheme. Farewell Function for S.S.C. students was arranged at S. M. Badat Residential School, Kondh on 28-02-2019. 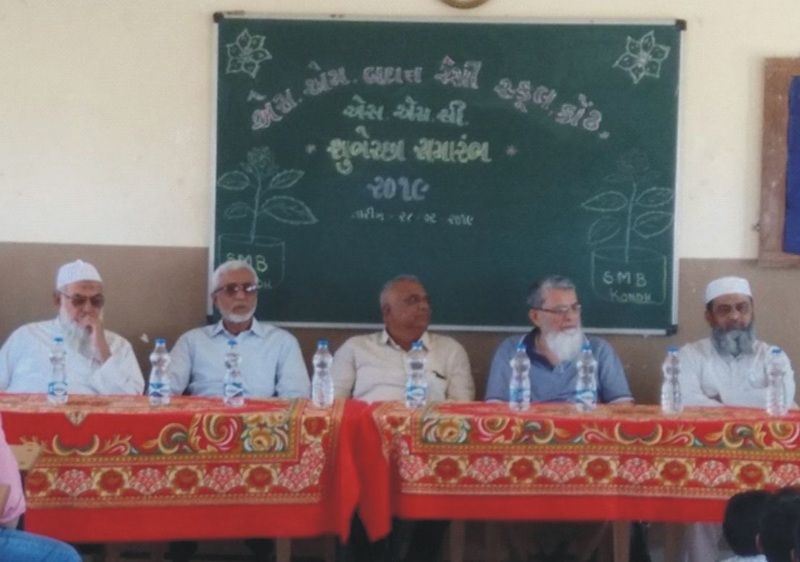 In this function society sectretary Janab Ahmedbhai Unia Sahab, Janab Yusufbhai Patel Sahab, Janab Iqbalbhai Unia Sahab, Janab Aiyyubbhai Jangda Sahab, Janab Yusufbhai Motala Sahab, Janab Ziyauddinbhai Kazi sahab, parents and guests were present. Principal Mr. Ayaz Kharodiya felicitate guests with flowers and introduce them. Then after Principal and speakers gave some important and useful tips regarding their examination. Shaikh Samira and Riyaz Limbada shared their expirences during their study peroid. One of the faculty Mr. Sarfarazkhan has given brief report on various activities perfomed during the year. Vote of thanks has been given by Divan sir and whole programme was anchored by Ashraf Dhorat sir. Ad. A.Rashid Matadar passed away on 26-03-2019 at Mumbai. He was a son of Marhum Ad. G.S.Matadar, Kapodara (Mumbai) who was the ex-President of Our Society. Maulana Saeed Vastanvi Sb. passed away on 28-03-2019 at Akkalkuva. He was son of well wisher of our society Maulana Gulam Vastanvi Sb. ARRIVAL: Yunus Ismail Daji returned from Morocco holiday and Hafez Yusuf Gulam Lunat with family returned after visited Manekpore-India. ARRIVAL: Hasan Muhammad Mayat returned from Morocco and Muhammad Amin Ismail Laher (Lal) returned after visited Alipor-India. DEATH (INNALILLAH) : Well wisher of our society and native of Kathor Janab Ibrahim Hashim Parekh Sb. passed away on 15-01-2019 at S.Africa. 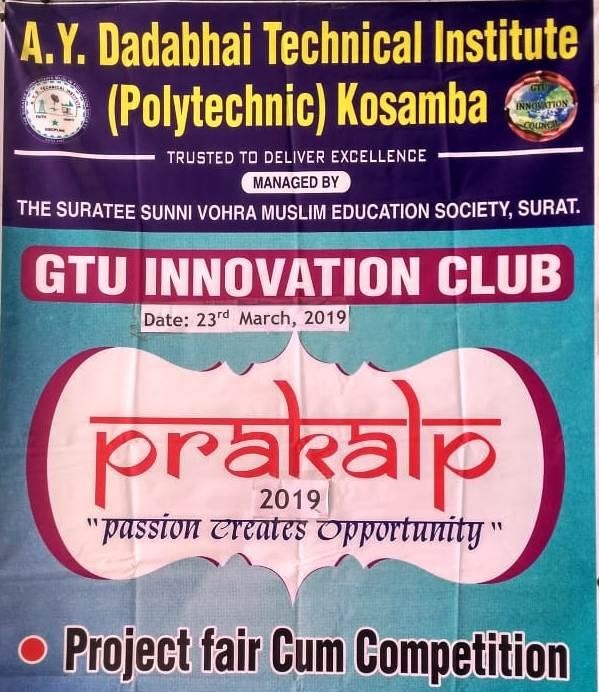 A Students Project Fair PRAKALP-2019 "Passion Creates Opportunity" was held under GTU Innovation Club on 23 rd March 2019 at A. Y. Dadabhai Technical Institute (Polytechnic), Kosamba in which 197 final year students has participated with 39 projects from all the branches of our Institute. Project models as well as posters were prepared & displayed on various innovative ideas by students from Civil, Computer, Electrical & Mechanical departments. We Appreciate and express our Co-hearted Gratitude to our generous donors all over the world for their kind & sympathetic consideration and praises for charities to our THE SURATEE SUNNI VOHRA MUSLIM EDUCATION SOCIETY, SURAT. We hope they will continue this noble deeds during the upcoming holy month of RAMDAN. Insha Allah. We assure our Philanthropic that every Penny paid to the Society will be utilized rightly and judiciously for the needy and most deserving persons of the Community. The long and useful Services rendered by our Society in the following various fields will testify the rapid progress made during the last seventy one years. 3. Medical help to poor and needy people. 4. Financial help to helpless widow. Union Bank of India, Station Road Branch, Surat OR Through our following authorized well wishers. We SURTI SUNNI VOHRAS have made a lot of progress since we started immigrating to Britain from the early 1950's. We have become monetarily better off. We have acquired a lot of secular education and many of our young men and women have joined the professionally qualified. We have also made a lot of progress in acquiring religious education and we have established many masajid, madressas, dar-ul-ulooms, tabligh centres and khanqas. We also have many hundreds of huffaz, qurra, ulema and alimas and through the efforts of the tabligh jamaat and our ulema we SURTI SUNNI VOHRAS now have more knowledge and more awareness about our religion. There is a need and we feel it is an urgent need for our attention to be turned towards the other needs of our people. We should not stop having more masajid, madressas and dar-ul-ulooms but we feel there are other needs we SURTI SUNNI VOHRAS as well as other Muslims have which we should try to address. We SURTI SUNNI VOHRAS have an ageing population as well as those who suffer from various physical and mental illnesses and we have those who are terminally ill. Some of our older persons as well as others will be in hospitals receiving treatment for their illnesses. A few may be in hospices. Others will be in nursing homes or in rehabilitation centres and some may be spending their time in day care centres. Whilst all such persons will be receiving good care and may also be receiving visitors, there will be those with no or very weak family and social connections. We feel we SURTI SUNNI VOHRAS should not leave such persons to spend their days or maybe their last days without being seen by people with whom they will have many things in common. Being cared for by professionally qualified persons is good but persons in care will be happy to see those persons with whom they will have many things in common besides their religious beliefs. Our SURTI SUNNI VOHRAS do visit their relatives, friends, those with social status, wealth and learning. All our members receiving care may not have relatives, friends, some form of social importance among our people or religious learning to attract visitors and well-wishers. Such persons will only have those who look after them to communicate with and if they do not speak English, they will have no one to talk to. Whilst we SURTI SUNNI VOHRAS are usually seen by other non-VOHRAS as a very close-knit group, we as insiders know we are not. We need to admit that we usually identify more with our relatives or people from our villages of origin and not with others. We feel this is a big barrier keeping us apart, a barrier we need to get rid of. Besides this barrier we also have other barriers brought about by the wealth some of us have, the secular education some of us have and the religious education some of us have. We feel we need to rid ourselves of the barriers we have created to keep others who do not belong to our group or class away from us. We should not feel very happy with what we have or the prestige we enjoy. It can be taken away by the ALMIGHTY ALLAH without anyone realising it. We must remember those among our SURTI SUNNI VOHRAS who live isolated lives. Many a times their isolation is not of their choosing. Such persons may not have relatives or may have moved away from their relatives for some reasons. We SURTI SUNNI VOHRAS should not ignore such persons. We should try to assist them and if we can we should ty our best to bring them back to their own people. In recent months we came across a couple of deceased Muslim persons whom no one knew. They were about to be cremated but with the ALMIGHTY ALLAH'S mercy some of our brothers came to know of them and they both got buried as Muslims. We feel there must be some others who die in hospitals, nursing homes or get killed in accidents who get consumed by fire as there is no one to identify them and get them buried as Muslims. In recent months we came across a very sad case where a SURTI SUNNI VOHRA'S badly decomposed body was found. Maybe he was a loner and had little contact with other Muslims or with anyone else. We feel there is a need for our SURTI SUNNI VOHRAS to turn our attention towards locating those who have moved away from their relatives and may be also from their religious beliefs. We feel we SURTI SUNNI VOHRAS who have a lot of religious education, organise and run many masajid and madressas and who support and run many charities through which many millions of less privileged Muslims are helped across the world should turn our attention towards our fellow Muslims as well as others in Britain who may need emotional, social, physical or financial support. We feel such work on our part will help us use our religious education, religious knowledge and our money which certainly will bring us rewards from the ALMIGHTY ALLAH. Ideally Muslims could be best cared for by Muslims in hospitals, hospices, nursing homes or rehabilitation centres. In the absence of such ideal provisions we should turn our attention towards offering voluntary services to institutions which provide care. As volunteers our men folk and women folk could visit those receiving care and provide them with emotional support. We feel whilst younger males and females could provide very good support, we feel older volunteers would be more suited to visit and spend time with older persons receiving care. As older persons they will be accustomed to conversing with those who speak their type of Gujarati and not the 'GET BY' Gujarati most of our younger members will be accustomed to. Besides this, older volunteers will know more about village life which will allow the older persons receiving care to share their own village experiences. In recent months we came across a couple of deceased Muslim persons whom no one knew. They were about to be cremated but with the ALMIGHTY ALLAH'S mercy some of our brothers came to know of them and they both got buried as Muslims. We feel there must be some others who die in hospitals, nursing homes or get killed in accidents who get consumed by fire as there is no one to identify them and get them buried as Muslims. In recent months we came across a very sad case where a SURTI SUNNI VOHRA'S badly decomposed body was found. Maybe he was a loner and had little contact with other Muslims or with anyone else. Ideally Muslims could be best cared for by Muslims in hospitals, hospices, nursing homes or rehabilitation centres. In the absence of such ideal provisions we should turn our attention towards offering voluntary services to institutions which provide care. As volunteers our men folk and women folk could visit those receiving care and provide them with emotional support. We feel whilst younger males and females could provide very good support, we feel older volunteers would be more suited to visit and spend time with older persons receiving care. As older persons they will be accustomed to conversing with those who speak their type of Gujarati and not the 'GET BY' Gujarati most of our younger members will be accustomed to. Besides this, older volunteers will know more about village life which will allow the older persons receiving care to share their own village experiences.